I read these two statements within a week of each other and have to ask: what is air? A falsely innocent question of course, as both comments surely wish only for relief from the weight of the world pressing on the words, which is after all what storytelling offers – the "all-appeasing And then..." as Handke has described it elsewhere. But what if air is something apart from that familiar alibi of escapism from too-serious life? If the fiction of who made the statements is any guide, air is a quality of lightness in relation to big themes rather than a retreat from them. It fills the high meadows of Repetition, in part about a brother lost in war, and In a Hotel Garden, in part about the legacy of the Holocaust. So perhaps it is also a matter of literary style, that which provides the aesthetic pleasure some claim is key to the reading experience of literary fiction so-called. Yet contrary to Handke, I think the first two volumes of My Struggle also have air, if the ghostly presence of the numinous over a dense narrative is air. Lightness, style, the numinous – air could be all three. What sets this apart from escapism is that the discovery arrives not as the regular epiphenomenon of narrative but inherent to it, and as part of a novel it becomes something more than the report of a private epiphany because of the patience taken by the reader to get there. 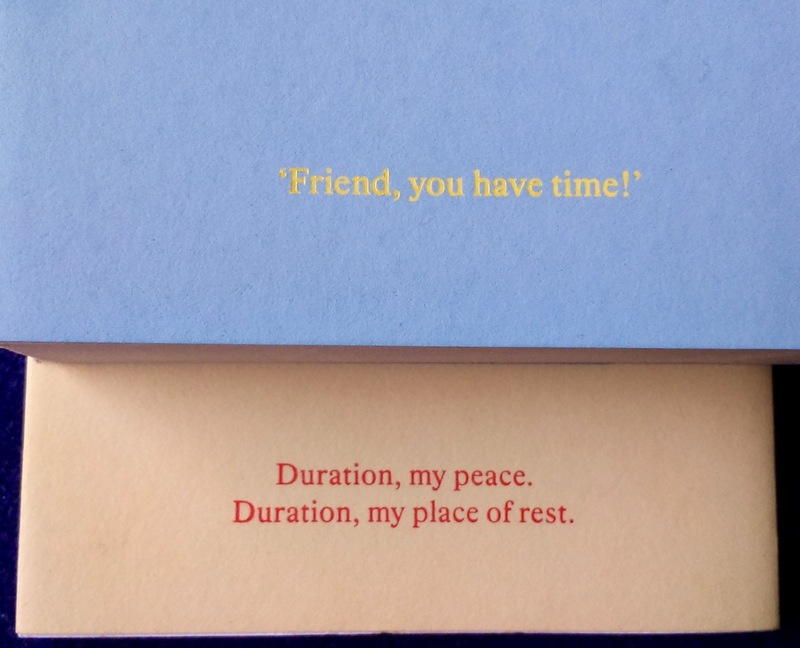 By performing a similar act of attention on a similar journey, the reader receives the same message, breathes some air. Reader, you have time. The blind window has become the book. In another of Handke's works closely related to Repetition, the truest definition of air is sought head on. We have had to wait for it however. Die Wiederholung was published in 1986 and Ralph Manheim's translation two years later. In the same year Handke published Gedicht an die Dauer but that has had to wait 27 years to appear in Scott Abbott's translation To Duration. It's been worth the wait. An example follows on the next page. On the way to the post office Handke hears two voices: one calling his name across a crowded square, which is when he realises he has left the manuscript of Die Wiederholung on a market stand, and another from a quarter of a century before in another city. Duration has this uncanny quality, akin to Proust's loops in time revealed in otherwise banal situations. He writes that he has experienced duration "as a traveller, as a dreamer, as a listener, at play, as observer" but, as Marcel discovered too, it cannot be relied on. When he tries to approach the essence of duration, only individual words come to mind: "spring, snowfall, sparrows, waybread, dawning, dusk, bandage, harmony." Duration is the presence of "the less conspicuous, the more poignant" and is why Handke is writing a poem and not a treatise. Once the subject and its uncertain context is set, the poem describes places and emotions that require less conspicuous and more poignant details to approach the essence of duration, details that might otherwise be swamped by the grand events of headline-grabbing novels or drained by the abstractions of Philosophy. Briefly ashore on boat trip around the coast of Turkey, Handke and his friends hike to a cove and forage for food to accompany a lobster back on the boat. its shells half open like sky-mussels. They pick grapes, figs and pomegranates, and go swimming in the wine-coloured sea. While this appears to be the blissful escapism we assume is key to duration, for Handke it is "darkened by an uneasiness, by a melancholy, by a pain" that turned him to stone, feeling he had no right to the experience. He was "a living spirit only...while working, in the usual nook, bent over the words". It was only on returning to his unkempt garden at home "with grey seed head shooting up from the grass" that he felt duration and recognised "ecstasy is always too much". Such dedication he says makes writing worthwhile, when it might otherwise be dismissed as indulgence when not feeding the organs of reportage. To Duration thereby also embodies duration and provides the possibility of duration to the reader. And this is where the specific genre of writing about duration becomes significant, why 'air' in a work of literature depends on genre, hence 'Gedicht' in the German title. The concept of duration is of course associated with the philosophy of Henri Bergson, and Handke acknowledges this with an epigraph from Introduction to Metaphysics that claims our intuition of duration requires many different images, presumably those embedded in the poem. This relates to Bergson's complaint that the terms we use to designate time are borrowed from those we use for space, so the means of our understanding of duration is what masks duration; it "refuses to consider transition," seeking instead the singular and unmoving. Philosophers have assumed it necessary to move out of time in order to go beyond human intelligence, but, Bergson argues, we are already outside of time and therefore must "get back into duration and recapture reality in the very mobility which is its essence". In Repetition, Handke allows the peculiar light which illuminates the space under a leafy canopy or a tent canvas to glisten between words, placed here with astounding caution and precision; in doing so, he succeeds in making the text into a sort of refuge amid the arid lands which, even in the culture industry, grow larger day by day . In every case, the metaphysic developed in Handke’s newer books, which aims to translate the seen and perceived into language, remains undiscussed. There is obviously no longer a contemporary discourse in which metaphysics may claim a place. And yet art, wherever and whenever it may take place, bears the closest ties to the realm of metaphysics. In order to explore this proximity, the writer requires a courage which should not be underestimated. It is only since reading To Duration all these years later that I am able to recognise that what makes Repetition distinct is its acknowledgement of the necessary movement of reflexivity within reading and writing. The present of writing and the past of life come together as and in duration, as the great opening line attests, containing as it does almost the entire novel to come: "A quarter of a century, or a day, has passed since I arrived in Jesenice on the trail of my missing brother." The qualification is pure air. while bending down for a thread. Note that these events of duration go against that cardinal rule of creative writing: show don't tell. The work is instead showing itself, as Repetition shows itself, as a veiled metafiction, a commentary on its own genesis, production and effects, which places it in a sequence with Proust's novel. For Filip Kobal, writing is the means to not only recover the past but to gain a future. What I had experienced at the age of twenty was not yet a memory. And memory meant not that what-had-been recurred but that what-had-been situated itself by recurring. If I remembered, I knew that an experience was thus and so, exactly thus; in being remembered, it first became known to me, nameable, voiced, speakable; accordingly, I look on memory as more than a haphazard thinking back—as work; the work of memory situates experience in a sequence that keeps it alive, a story which can open out into free storytelling, greater life, invention. For the reader, the book is a necessary part of that greater life. 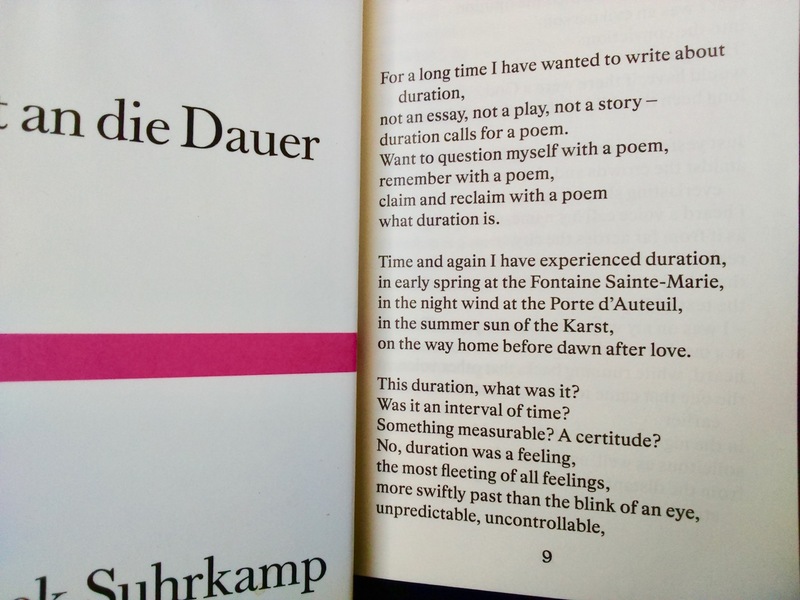 Note: both Repetition and To Duration are available from The Last Books, whose website contains a translation of Sebald's essay as well as a few other Handke-related gems.